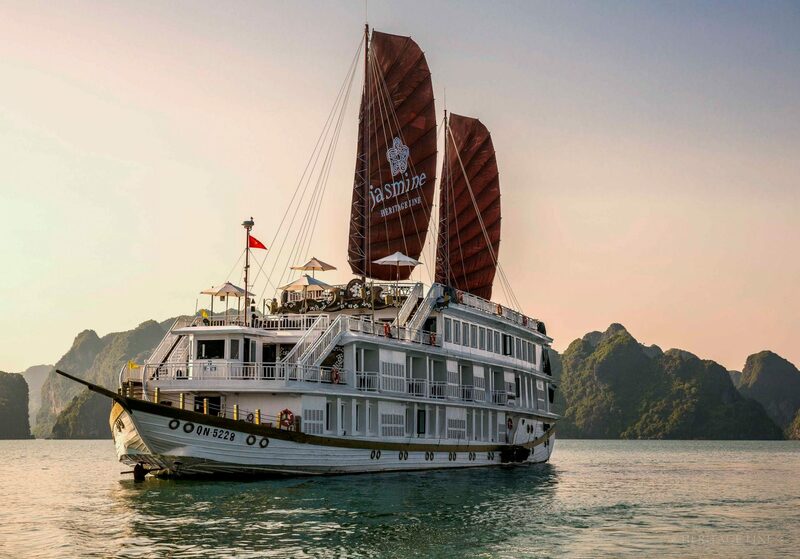 Jasmine is the second of three, deluxe Vietnamese junk-style vessels operated by Heritage Line in Halong Bay, one of Asia’s most magnificent natural splendours, where over 1,600 limestone islands and rocky islets jut out of emerald green waters. Those wishing for comfort paired with the romance of adventurous travel while sailing through Halong Bay’s mythical beauty will relish the Jasmine – sturdy, but with a decidedly languid air. Built in the deep-rooted spirit of a classic Vietnamese wooden junk, topped with three large, tawny sails, Jasmine is designed French-Indochinese style, with rich woods and understated elegance – evoking the stately air of an Indochina-era cruising boat. Slowly gliding past an ethereal-like seascape revealing secluded grottoes, coves and lagoons, Jasmine has been specifically designed for maximum views of Halong Bay’s wondrous sights. Spread across two floors, the 23 beautifully appointed, Staterooms and Suites provide either panoramic French-styled windows, or private balconies. Two expansive public decks – a signature feature – include a broad Sundeck that is elevated high, the perfect perch for spectacular bay and sunset vistas. Jasmine’s experienced and friendly crew provide outstanding service – helping guests savour even more the ultimate cruise destination.